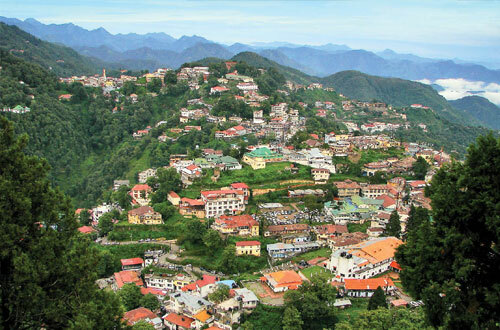 Mussoorie, famously known as “Queen of Hills”, is a hill station in Dehradun District of Uttarakhand. It is located about 35 km. from the city of Dehradun and 290 km. from Delhi. Mussoorie is situated at an elevation of 5,990 ft in the lower hills of the Garhwal Himalayan ranges. The highest point is Lal Tibba at a height of about 7500 ft. With its green hills, varied flora and fauna, glittering views of the Doon Valley and Shivalik Range to the south and commanding snow ranges to the north-east, Mussoorie is a fascinating hill resort presenting a fairyland like atmosphere to the tourist. 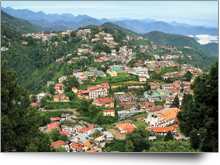 Mussoorie derives its name from a plant “mansoor” which grow in this region in large quantities. The history of Mussoorie dates back to 1825 when Captain Young, a British military officer and Mr. Shore, the Superintendent of Revenues at Dehradun constructed a shooting lodge there. 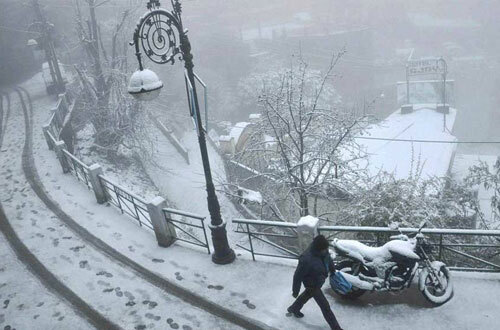 The main promenade in Mussoorie is called the Mall, as in other hill stations. The Mall stretches from the Picture Palace on the east to the Public Library in the west. St. George’s College: Founded in 1853, St. George’s College is among the oldest and most reputed schools in India. The school is spread over and area of 400 acres and is popularly called as “Manor House”. Since 1893 it has been run by the Patrician Brothers. The school’s imposing façade stands out as one of the main architectural attractions of Mussoorie. Woodstock School: Founded in 1854, Woodstock School is an international, co-educational, Christian residential school located in Landour. It is among the most well-known boarding schools of the Indian subcontinent. The school’s campus spreads over an area of 250 acres in a forest region home to a variety of flora including Oak, Pine and Rhodendron and with an altitudinal range of 350 m.
Oak Grove School: Founded in 1888 by East Indian Railway the school is different from other schools in Mussoorie for two reasons: one, it is affiliated to Central Board of Secondary Education, New Delhi unlike the other schools here; and second, it is a secular government aided school run by the Northern Railway today. The school has three semi independent wings. 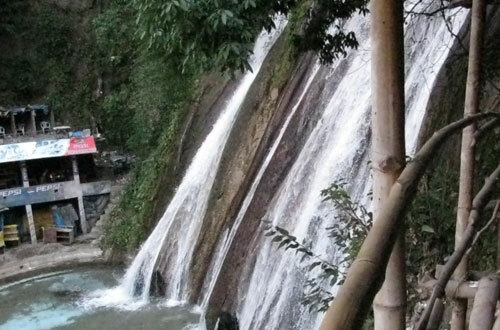 It is situated on two hills in Jharipani, 8 km from Mussoorie, near Jharipani Fall. Wynberg Allen School: ranking among the finest schools in the country today, Wynberg Allen School was founded in 1888 by a group of friends Mr. Alfred Powell, Mr. & Mrs. Arthur Foy and Brig. J.H. Condon. The school has its premises in Wynberg Estate and accommodates 700 students. It has two branches: the junior branch – Wynberg and the senior branch – Allen. Convent of Jesus and Mary, Waverly: The school was established in 1845 by the Religious Sisters of Jesus and Mary Mussoorie Educational Society. It is an all-girls school. Waverly is situated at an elevation of 7000 ft. above sea level on one of the most extensive, healthiest and well wooded hills of Mussoorie. Thousands of girls of all descents have passed through the school. The small, inadequate bungalow, which was all the accommodation at first, has given place to a group of tastefully conceived buildings dominating the town of Mussoorie today. Guru Nanak Fifth Centenary School (GNFCS): Founded in 1969, GNFCS is one of the best boarding schools in India. The school was founded in the memory of Sri Guru Nanak Dev Ji on the occasion of his 500th birth anniversary. The boys are housed at Vincent Hill, 3 km from the Library Chowk; in a campus spread over 45 acres. The girls at Shangri La situated at 6,750 feet (2,057 m) above sea level on an 11-acre (45,000 m2) plot, facing the snow clad Himalayan peaks, to the north, wooded with cypress, cedar and oak, on the south and west. Indo Tibetan Border Police Force – Academy: The premier academy of the ITBP is housed in the library area. Indo Tibetan Border Police Force is an elite police organization of the Government of India. It is a venerated institute for comprehensive training for ITBP officers. The academy moved to Mussoorie in 1978 as a consequence of reorganization of the force. It now has a helipad, modern computer labs, simulators, artificial tennis courts and the best library in town. The Academy has grown over the year, state of art facilities have been established here to provide latest modern training to the trainees here. ITBP also serves as the first responder to any minor or major rescue and relief work to the local inhabitants of Mussoorie. Other schools in Mussoorie include Mussoorie Modern School, CST Mussoorie, Mussoorie International, Tibetan Homes and St. Clare’s Convent School. The Lal Bahadur Shastri National Academy of Administration, the premier training institute for IAS and other civil services, is also housed in Mussoorie about 2 km from Gandhi Chowk. By Air: Jolly Grant Airport, Dehradun is the nearest airport to Mussoorie. 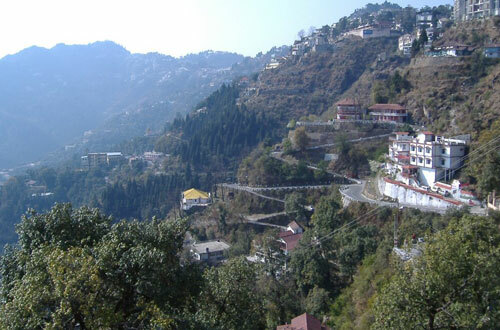 Located 60 km from Mussoorie, it is well connected by metalled roads. Taxis are easily available to-and-fro between Jolly Grant Airport and Mussoorie. The airport is well connected to Delhi by daily flights. By Road: Mussoorie is well connected by motor able roads. 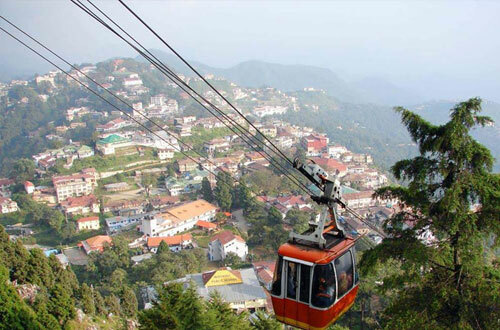 Buses and taxis are easily available for Mussoorie from all major tourist destinations of Uttarakhand and from Delhi. Luxury and normal buses to Mussoorie are available from ISBT Kashmiri Gate, Delhi. Gun Hill: The second highest point of Mussoorie, at an altitude of 2024 m, Gun Hill can be reached by a cable car starting at the Mall. Gun Hill offers a panoramic view of the Doon Valley and the Himalayas. Before independence a Gun (cannon) was mounted here and was used to be fired at midday for people to adjust their watches. 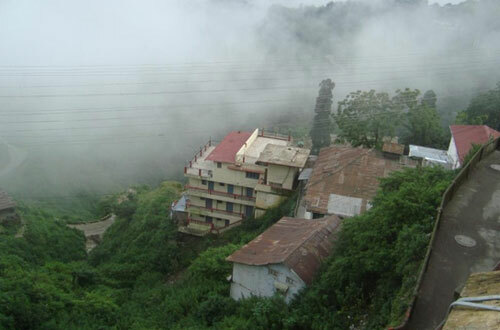 Today, Gun Hill houses the water reservoir of Mussoorie. Municipal Garden: It is a picnic spot having a garden and an artificial mini lake. The lake has a recreational facility of paddled boats. 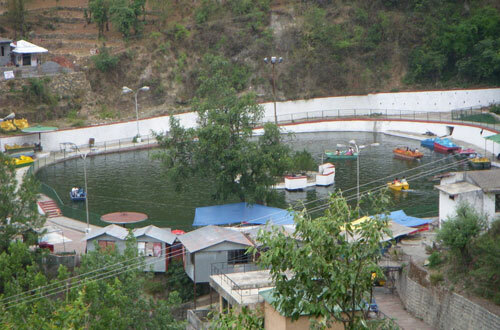 Mussoorie Lake: It is a newly developed picnic spot by the City Board with collaboration with the Mussoorie Dehradun Development Authority. 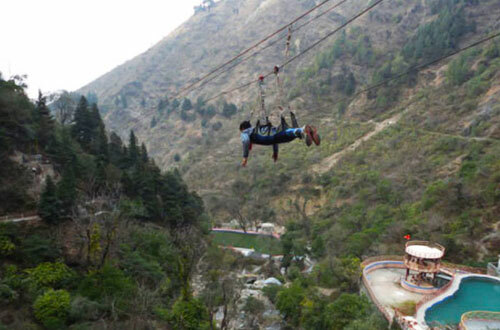 It is situated at a distance of 6 km from Mussoorie on the Mussoorie-Dehradun road. It offers an enchanting view of the Doon Valley and a facility of pedaled boats. Lake Mist: It is a good picnic spot equipped with accommodation, restaurant and boating facilities on the Mussoorie-Kempty road. The Kempty River flows through the spot making many small waterfalls. The place showcases nature in an exquisite manner. 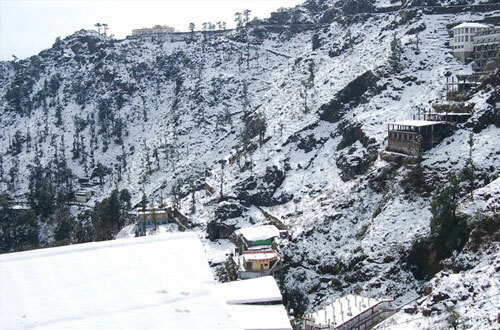 Childer’s Lodge: Located on the highest peak of Mussoorie, near Lal Tibba, it is a property of Harakh Chand Nahata family spread over more than 300 acres. It is also called as “Nahata Estate”. The view of the snow clad mountains from here is exhilarating. Bhatta Fall: It is an ideal place for a picnic with a fall making different ponds for water amusements and bathing. It is located 7 km from Mussoorie on the Mussoorie-Dehradun road near Bhatta Village. Sir George Everest’s House: 6 km from Gandhi chowk, the Park Estate is where on can find the remains of the building and lab of Sir George Everest, the Surveyor-General of India (1830-1843). The place has an enchanting view of the Doon Valley, the Aglar River valley and the snow clad peaks of Himalayas. Nag Devta Temple: It is an ancient temple dedicated toe the Snake God, Lord Shiva, situated 6 km from Mussoorie on Cart Mackenzie Road. Vehicles can go right up to the temple. Cloud End: One of the first four buildings in Mussoorie was a bungalow built in 1838 by a British Major. Today it has been converted into a hotel. The place is full of flora and fauna and has a calm, peaceful atmosphere. Lal Tibba: It is the highest point in the two of Mussoorie. There is a tall tower at the edge of the cliff having an old telescope through which you can take a closer look at the Himalayan range. Camel’s Back Road: This road begins from the Rink at Kulri Bazar and terminates at Library Bazar stretching 4km. The place offers a picturesque view of the sunset and a life like resemblance of a sitting camel. One can also enjoy long walks and horse riding here. British graveyard having ancient graves on the way provides new dimension to the walk. Evening at Camel’s road is a memorable experience as it offers a ravishing sunset view in the Himalayas as sun paints the mountains in brilliant hues. The Mall Road: The Mall Road is one of the most crowded places of Mussoorie. The structure of the road takes you back to the colonial period of British rule. There are numerous restaurants, hotels and shops on this road. The Methodist church is situated on the Mall and is around 100 years old.